This little idea is so simple yet beautiful. Make your own ‘Hearts and Hand Tree’ using your little one’s hand to make the tree trunk – you can trace around it or use paint and stamp their hand print on. Add your own love heart leaves by using a heart shaped paper punch (if you have one) or help your little one cut them out. Use an old magazine, old gift wrapping paper, newspaper -whatever you like! I think this one would be gorgeous framed. In no time at all you are sure to be marveling at how little their hands were. 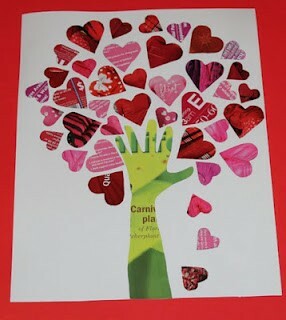 This entry was posted in creative stuff and tagged craft, family, hearts, inspire, love, nursery, paint, rainy day, tree by rudyandthedodo. Bookmark the permalink.